Alfonso Cuarón, the Oscar winning director of Gravity and Children of Men, delivers another cinema masterpiece. Roma is a vivid, deeply immersive period drama. Filmed in stark black and white, it transports you seamlessly into the lives of its characters. The story told is personal, but reflects the societal changes and conflicts of the time. What begins as subtle and nuanced, evolves into heartbreaking resolve. Roma is achingly beautiful. Set in 1970 Mexico City, Cleo (Yalitza Aparicio) is the maid of a wealthy doctor's (Fernando Grediaga) family. She follows the direction of his wife, Sofia (Marina de Tavira), and her mother, Abuela Teresa (Verónica García). Cleo cleans and does laundry, but her primary focus is to care for the four small children. The family lives in a large, multi-level house in an upscale neighborhood. Roma begins with the doctor leaving for Canada on business. His departure is abrupt and cold. Sofia is hysterical as he drives away. Cleo and Sofia shield the children from their father's absence. Cleo's own life becomes complicated by romance. Cleo is enamored by Fermin (Jorge Antonio Guerrero), an angry young man devoted to martial arts. He disappears when Cleo tells him she's pregnant. Embarrassed and hurt, Cleo goes to Sofia for guidance. Outside their home, Mexico is in social upheaval. Students are protesting the government's violent treatment of the indigenous people. The two women guide and protect the family through a perilous time. Roma is seen from Cleo's perspective. She is loved by Sofia and the children, but is still a servant; subject to harsh rebuke. Cleo is an indigenous girl from the country, as are the majority of maids and cooks for the elite rich. This disparity is brilliantly addressed by Alfonso Cuarón. We go from the bright, airy and spacious homes of the wealthy; to the squalid, mud covered tin shacks of the poor. While the difference is obvious, Cleo does not take umbrage with her station in life. When her world begins to crumble, Cleo is protected by Sofia. She is an inexorable part of the family. Roma is filled with artful juxtaposition. Sofia and Cleo, master and servant, rich and poor, are both dealing with abandonment. The doctor walks away from his family. Fermin refuses to acknowledge Cleo's pregnancy. The women are left to pick up the pieces and carry on. This is where Roma hits like an emotional freight train. The expertly crafted exposition puts the audience directly in the women's shoes. You feel their betrayal, loneliness, and struggle. But they are not bitter or vindictive. The final act of Roma is enthralling. Cuarón's protagonists continue on with kindness and strength. The use of black and white film contributes greatly to the narrative. When Cleo wakes the children for breakfast, Roma takes on a dreamy atmosphere. The opposite happens when Cleo runs through the chaotic city streets. The different shades of black and grey forces the audience to imagine the sceneries true palette. The same goes for the violent climax. Blood is not a visceral red, but an inky, hollow black. The lack of definitive color spurs intense reactions. Cuarón, who's also the cinematographer, manipulates light like a puppet. He has a genius understanding of how lighting can affect mood on film. Roma has very little accompanying music. You only hear music when the characters hear or play music. This lack of background noise allows other sounds to establish the setting. The house has a dog and several bird cages. Throughout the film, you hear them in the background. The dog barking, the birds chirping; it adds tremendous realism to the plot. Roma gives Netflix a major player for awards contention. It rightfully deserves every accolade bestowed; already winning the Golden Lion at the prestigious Venice Film Festival. 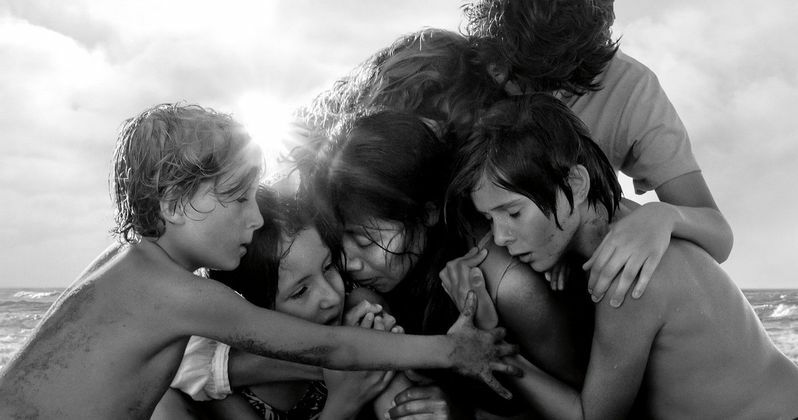 Roma is easily the favorite for Best Foreign Film. Cuarón is solidly in contention for screenplay, cinematography, and another Oscar for Best Director. Yalitza Aparicio is so good as Cleo. We may see her standing at the awards podium as well. Roma will have a limited theatrical release on November 21st. It will be available to stream December 14th on Netflix. I highly recommend seeing Roma in the theater. It's such an elegant film. It deserves to be seen on the best screen possible.